Mt Coot-tha is best known for its spectacular views of Brisbane city from its lookout. 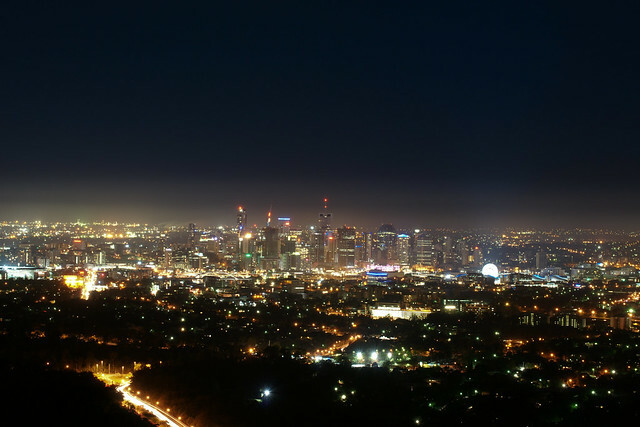 Approximately only a short ten-minute drive from the CBD of Brisbane, Mt Coot-tha is a great spot to go for a quick or lengthy visit during the day or at night. Personally, I would recommend going both during the day and at night to see the contrasting landscape as night falls over Brisbane. On top of the lookout, there is a small café and gift shop, as well as the Summit Restaurant — which can get fairly busy as it is often considered to be a romantic restaurant with great views. The views and romantic feeling of the place are also the reason why you will often find newly weds getting their wedding photos taken on top of the look out. While the lookout is the star of the show, Mt Coot-tha does have more to offer; Mt Coot-tha is home to the broadcasting stations in Brisbane (including seven, ten and nine) and also has a few parks, treks and picnic areas including JC Slaughter Falls and Simpson Falls. There are also plenty of places to pull over and park on the mountain road, which also offers great views, and tends to be filled with plenty of people during the annual Brisbane RiverFire. See additional photos from Mt Coot-tha.